Today’s share has the last of the basil from the hoophouse — it’s a little funky so you may need to pick through it and rinse it before pesto-ing. A new item today (sort of): green tomatoes. There also may be a few funky spots on these to cut off as you prepare them. They can be used for chutneys, jams, or fried green tomatoes, among other things See recipes links at the bottom…. Also new & exciting today is the Long Pie Pumpkin! This is a New England heirloom and it has fabulously smooth texture for pies. Of course you can use it for any sort of pumpkin-y purpose you like. Another new-ish item: Red potatoes! These are called Mountain Rose, and as you will discover are also red on the inside. I’m excited to try these, as their yields were pretty good. You’ll see some alternation between this variety and the fingerlings over the next few weeks. No carrots or beets today as I thought the potatoes would do for our root this week and the carrots & beets will be needed toward the end of the CSA season when we don’t have a lot of other crops. One more new crop this week (whew! a lot of newness! ): Collard greens! Yes, the clubroot has spared a few of my fall brassicas and these are some of them. They have nice big leaves right now that are pretty tender. I liked them de-stemmed, chopped thinly, sauteed briefly in your favorite oil (I prefer bacon grease), and then braised covered with a little water in the pan until tender. You can add a bit of salt, pepper, maybe a little apple cider vinegar or lemon juice a the end. This is a great side for any meal (and is basically what I do for kale and chard as well, though I leave the smaller bits of stem in usually on these as they seem to cook faster than collard stems). To fill out the share there are about 3 peppers, 1-2 ripe-ish tomatoes, two heads of lettuce (Parris romaine and “Sunset” is the red leaf), 2-3 cucumbers, a head of garlic to help you make pesto, a handful of small yellow onions (last of these). 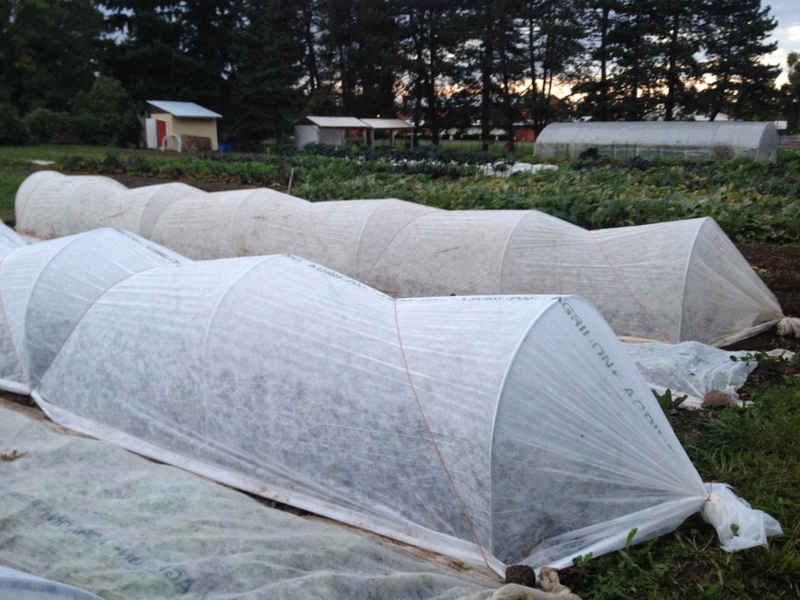 Yesterday I put up the first “quick hoops” over some of the chicory beds (see photo below). I’m excited to try these out on the farm. They were pretty easy to make with a simple hoop bender and some 10 ft electrical conduit. It looks we’re going to get a decent chunk of dry weather, which is great for getting tilling more finished areas in, seeding cover crop, as well as prepping and planting the garlic beds. Enjoy the fall sunshine! -Matt.